Natural perfumer Anya McCoy of Anya’s Garden released two new fragrances this winter: Kaffir and Temple. I have a kaffir lime tree (Citrus hystrix) growing in my bedroom and love the scent of its flowers, fruit and leaves, and the word “temple” brings to mind exotic travels, smoky incense, and the Buddhist and Hindu artworks I discuss on my gallery tours at the Seattle Asian Art Museum — so, based on their names alone, I had to try McCoy’s latest perfumes. Kaffir contains kaffir lime leaf, galbanum, tarragon, tinctures of eight varieties of jasmine, Grasse jasmine, heritage oak, musk seed, agarwood and leather. Kaffir starts with sumptuous, and pungent, galbanum and lime leaf notes that produce earthy and deep “green” aromas. As Kaffir develops, one smells the foody scents of Thai cuisine, which uses lime leaf to season soups and curries. The first time I wore Kaffir, my partner exclaimed: “You smell like Tom Ka!” (and I do love the “hot” lime leaf note in this perfume). Peeking through the strong lime leaf and galbanum accords is the scent of lush “hothouse” jasmine. I can also detect a (Robert Piguet) Bandit-like leather note in Kaffir’s dry-down. The “temple” I imagine while wearing this perfume is a Hindu shrine in a crowded Indian city, a shrine surrounded by stalls selling fragrant foods, spices and natural medicines. The listed notes of Temple are orange juice, borneol crystals, aglaia flower, cassia, Ayurvedic herbs and spices, Laotian and Vietnamese agarwood/oud, and earth tincture. Temple begins with a robust ‘hot metal’ aroma (a friend said it smelled like overheated spark plugs). After this rather shocking opening comes a pleasant medicinal-herbal smell that reminds me of insect-repellent crystals I used to buy in Los Angeles at a shop that imported food, art and sundries from India. After its clamorous-camphoric phases have passed, Temple begins to sweeten and smell foody (just as Kaffir does). As Temple turns sweet on my skin, I smell as if I’ve been dipped into a tub of blackstrap molasses. The molasses phase leads to a more complex spice cake phase where I begin to smell cassia and the scent of moist, dark brown sugar. Temple also provides fleeting whiffs of a hay-like note and agarwood. After two hours on my skin, Temple turns musky and comes close to producing an amber-like aroma (all that’s needed is some vanilla). As I wear Temple, dark orange, russet, umber, teak and golden amber colors come to mind — this is a sweet, dense, warm and dusky fragrance. 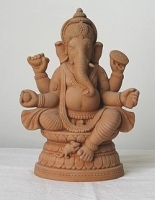 (I can imagine the dessert-loving god, Ganesha, using Temple as his “comfort scent.”) Temple perfume would be sensational in candles and home diffuser products. Temple is a limited edition fragrance and fifty percent of the profits from its sale will be donated to charities that assist people and animals after natural (and, I assume, man-made) disasters. Kaffir and Temple will appeal to people who like quirky scents and scents with HEFT; I enjoy both perfumes but Kaffir is my favorite of the two because I find “green” fragrances hard to resist. I tried both scents in perfume (extract) concentration and the lasting power of Kaffir and Temple was OK — approximately 3-4 hours when applied liberally. As with most natural perfumes, the prices of Kaffir and Temple are high: one ounce of perfume will set you back almost $400 for Kaffir and $500 for Temple. Kaffir is available in perfume extract (3.5 ml/$45) and in Eau de Parfum (15 ml/$80); Temple is only available in perfume extract (3.5 ml/$60). For buying information and to learn more about Anya McCoy and her company visit the Anya’s Garden website. Note: both images, Citrus hystrix & Ganesh, via Wikimedia Commons.